If you find strange bug bites or rashes on your skin, your probably have bed bugs. Call us for an inspection to identify them and then eliminate them. Arden Termite and Pest Control provides a complete line of services for bed bug control in the greater Sacramento area. Bed bugs are parasitic insects that feed exclusively on blood. The common bed bug is the best known as it prefers to feed on human blood. The name bed bug derives from the preferred habitat of bed bugs: warm houses and especially near or inside beds and bedding or other sleep areas. Bed bugs are mainly active at night. A number of health problems may results from bed bug bites, including skin rashes and allergic symptoms. Bed bugs are not known to transmit any diseases. Bed bugs have been known to humans for thousands of years. At a point in the early 1940s, they were mostly eradicated in the developed world mostly by using DDT, but have increased since 1995, likely due to pesticide resistance, governmental bans on dangerous yet effective pesticides, and increased international travel. Diagnosis of an infestation involves both finding bed bugs or the related symptoms. Treatment involves the elimination of the insect (including its eggs). Bed bug bites may lead to a wide range of skin manifestations from no visible effects to prominent blisters. The effects can include skin rashes, psychological effects, and allergic symptoms. Although bed bugs can be infected with at least 28 human diseases, no studies have found that the insects are capable of transmitting any of these to humans. We specialize in bed bug treatments in hotels, motels and apartment buildings. 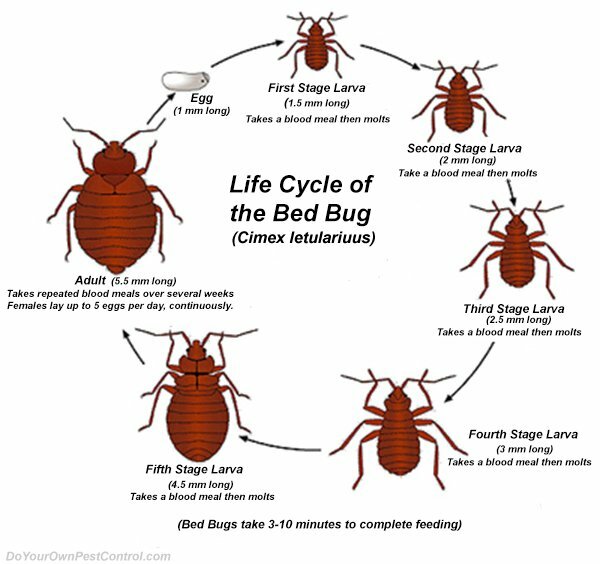 We offer a variety of treatment options depending upon the degree of bed bug infestation. We are discreet and inconspicuous. Our bed bug control vehicles and uniforms are unmarked and our equipment in concealed. Your other tenants, guests or neighbors won't know why we are in the building. We service Sacramento, Placer, El Dorado and Yolo counties. 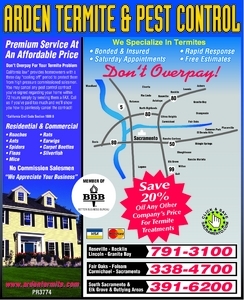 We are fully licensed by the California Structural Pest Control Board. All of our inspectors and applicators are licensed by the state of California and receive continuing education to stay informed of the latest pest control technology. We recommend Crossfire for bed bug control. We use Steam for heating small areas for bed bug control. We use Space Heaters for heating entire rooms for bed bug control..
We recommend other local Sacramento pest control companies for the control of ants, bees, carpet beetles, earwigs, fleas, mice, rats, roaches, silverfish, spiders and other household pests.